One of the most exciting things coming to Hulu this month might be the American debut of the emotional family drama Butterfly, from ITV in the U.K. A three-part miniseries, Butterfly tells the story of the family of an 11-year-old struggling with gender dysphoria and the desire to transition from a boy to a girl. Max (Callum Booth-Ford) has dressed as a girl at home for years, and it was his own inability to deal with his son’s gender nonconformity that drove Stephen to leave the family. At 11 years old, Max, now choosing to go by Maxine, wants to live life as a girl publicly. Her estranged parents must come together to find a way to support Maxine and rebuild their family, while each finding a way to deal with their own feelings and issues with their child’s gender. The series takes on heavy subject matter, but in a careful and thoughtful manner that looks at the real struggles that face trans youth and those dealing with gender dysphoria. 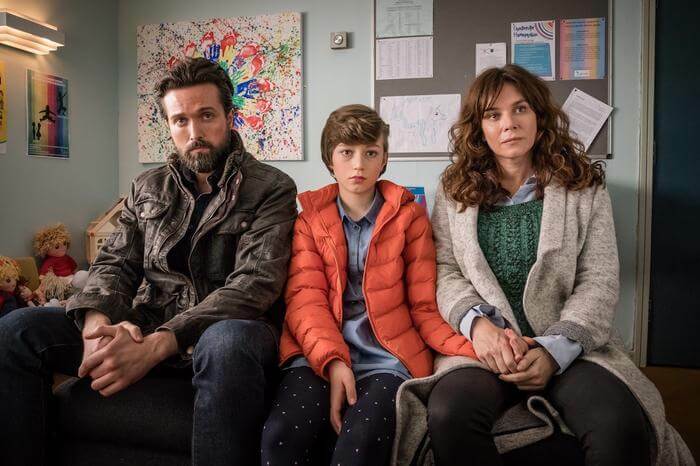 Butterfly also stars Emmy award-winning Anna Friel (Marcella, Pushing Daisies) and Emmett J. Scanlan (In the Flesh, The Fall) as Maxine’s parents, Vicky and Stephen, who reunite to decide how to support Maxine. One of few series to really tackle these issues on a mainstream family level and focused on trans children, Butterfly was an immediate critical hit when it debuted in October 2018. The series had a supportive response from members of the trans community in the U.K., as well as receiving praise for its honest and touching portrayal of the challenges facing trans youth and their families. Preparing to tell this story, BAFTA award-winning writer and series creator Tony Merchant spent time with trans families, as well as the organization Mermaids, which works to support children, young people, and families dealing with gender nonconformity and dysphoria, and to raise awareness of the issues facing these young people. The effort seems to have paid off, as ITV audiences embraced the heartwarming and challenging family drama. The series holds a 100% fresh critical rating from Rotten Tomatoes (with a respectable 80% from viewers). Hulu has unique streaming rights to the series, and will debut it to U.S. audiences on January 18, 2019. $39.99/month commercial free + live TV of up to 50 channels, as well as on-demand feature. Hulu can be watched through Hulu.com online, as well as apps for Apple TV, Roku, Chromecast, Amazon Fire, Xbox, and mobile devices.